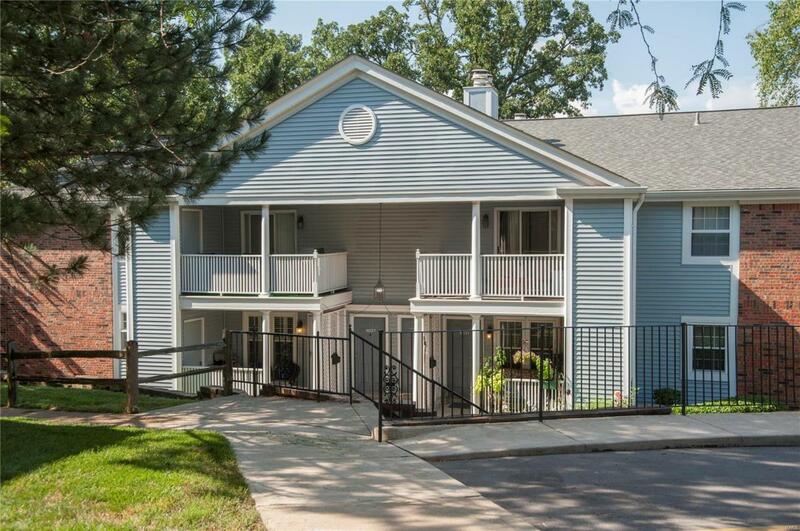 Nestled in a quiet corner of Brentwood Forest, this beautiful 2 bed/2 full bath condo was recently renovated. A secluded green area welcomes you to the covered front porch. The popcorn ceilings were removed & new lighting (some recessed) was installed. The luxury vinyl flooring creates a modern look. The bedrooms have new carpeting & each has a walk-in closet designed by the St. Louis Closet Company. The entire unit was recently painted in a modern grey. The kitchen features beautiful quartz counter tops, deep double sinks & custom cabinets. There is an attached breakfast bar with drop down glass cabinets above. The modern open design facilitates the cook in the kitchen chatting with guests in the dining or living rooms. Plantation shutters throughout. There is extra storage space off the front porch. Enjoy the walking trails, tennis courts & pools of Brentwood Forest, a family friendly active neighborhood. Great access to Clayton, public transportation, highways 40 & 170.